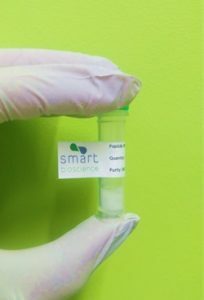 Smart Bioscience peptides are delivered as lyophilized powder in 2 mL microtubes, that needs to be reconstituted. The solubilization is a critical step for a successful peptide assay. Improper peptide solubilization results in inaccurate peptide concentration, which can introduce experimental errors into data or lead to experimental failure. Finding the ideal solvent to dissolve your peptide is often a challenge. Even if the solubility of Smart Bioscience peptides is tested, the guidelines below may be helpful in preparing peptide solutions. Test peptide solubility using a small amount of the product, rather than the entire sample (Consideration to take into account when defining the quantity and the number of aliquots to order. We recommend to dedicate 1 aliquot tube of 1 mg for this purpose). Centrifuge to spin down any powder on the tube sidewall before use (10000xg for 5 min). Allow peptides to warm to room temperature before reconstituting. Use sterile and ideally oxygen-free water or buffer (Tris or phosphate, buffer at pH 7) when preparing peptide solutions. Briefly Sonicate the mixture to aid peptide dissolution (3x 10sec, ice between). Chill the tube on ice between sonications. Sonication improves solubility and minimizes peptide aggregation. If precipitation occurs, a gentle warming of the peptide solution would be helpful (Avoid excessive warming of the sample!). A peptide properly solubilized will result in a transparent, particule-free solution. Count the total number of charges of the peptide at pH 7 (D, E, K, R, C-terminal COOH, and C-terminal NH2). Calculate the overall net charge of the peptide. Charges < 0: Acidic peptide;Try to dissolve it in a basic solution by adding 10% NH4OH or ammonium bicarbonate in your buffer. Charges > 0 : Basic peptide; Try to dissolve it in an acidic solution by adding 10% acetic acid, 0.1% TFA, 0,1% formic acid in your buffer. Neutral peptide: if the peptide contains > 25% charged residues (e.g., D, K, R, H and E), it is generally soluble in water or aqueous buffers. Below 25% charged residues, it is recommended to use organic solvents (DMSO, ACN, DMF). Cys, Met or Trp-containing peptides are susceptible to oxidation. Therefore, it is recommended to dissolve them in oxygen-free buffers. Moreover, DMSO should be avoided when handling oxidation-sensitive peptides. Cys-containing peptides can form unexpected disulfide bonds (intra or interchain) that can be prevented by using reducing agents, such as DTT (dithiothreitol). Very short peptides consisting in less than five residues are usually soluble in water or aqueous buffer, except when the entire sequence consists of hydrophobic amino acids (e.g., W, L, I, F, M, V, Y). In this case, the use of organic solvents is necessary. Peptides containing 50% or more hydrophobic residues (W, L, I, F, M, V, Y, P, A) are generally poorly soluble in aqueous solutions. We recommend to dissolve hydrophobic peptides in 100% ogranic solvent (DMSO, DMF or acetonitrile) and subsequently dilute with water or buffer to the desired concentration. If peptides precipitate, they need to undergo a freeze-drying step before attempting another solubilization to reach a lower dilution. DMSO is the ideal organic solvent for biological applications because of its low toxicity. If DMSO interferes with your experimental system, use DMF or acetonitrile as an alternative. Addition of denaturating agents, such as 6M urea, 6M urea with 20% acetic acid, or 6M guanidine, can help in reducing the aggregation of peptides by disrupting hydrogen bonding network. However, these compounds can interfere with most biological systems and therefore their application is rather limited.